When a child is diagnosed with ADHD, the whole family is affected. 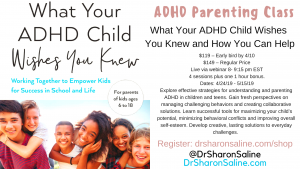 In this workshop, taught by author and ADHD expert Dr. Sharon Saline, you will gain the essential information you need to understand ADHD and improve your child or teen’s executive functioning skills more effectively and patiently. You’ll learn how the ADHD brain works, how to navigate school and advocate for your son or daughter, how to reduce conflicts at home and how to help them become more confident and competent. She will also address hot topics such as managing technology, anxiety, siblings and social relationships. Learn directly from Dr. Sharon Saline as she shares her valuable insights and recommendations about living successfully with ADHD. Based on her award-winning book, What your ADHD child wishes you knew, Dr. Saline mixes lecture, exercises, and discussion to help you develop creative, lasting solutions to everyday challenges. Only $119 with early registration discount before April 10, 2019. $149 Regular price.